This has been one of the most relaxing weekend so far. I had Friday to relax, ran some errands, and squeezed in some school group meeting. On Saturday, I went to New York with my hubby for a quick get away. Even though we needed a longer get away, this was a bit helpful to get away from my crazy schedule. Now, I can't wait for May to get here so that I can take a longer vacation and relaxation. While in New York, I did a little shopping, walked around a lot, and slept a lot. I got a chance to go to Brooklyn for the first time because we found this Nigerian restaurant called Buka. I wish I could take most of the food home. I haven't seen any Nigerian restaurant in Maryland that offers a nice variety. On another note, my husband and I are planning on visiting New Orleans for a mini trip sometime this summer. I heard they have amazing food and the french quarters is beautiful. Has anyone been to New Orleans or live there? Where is the best place to stay, eat, and tour? The colour is gorgeous on u, and the accessories are banging as well. I LOVE the colors in this look! The yellow and green and leopard are a great combo! Sounds like you had a great weekend! Hope it continues to be a relaxing week! 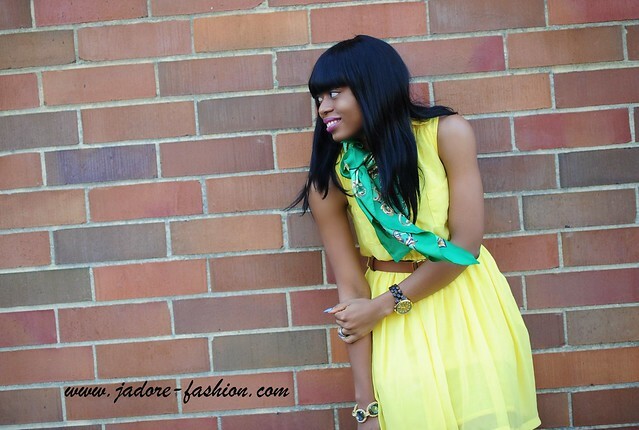 I love the dress and the green scarf completes the outfit! Love your blog! Beautiful as always Stella! 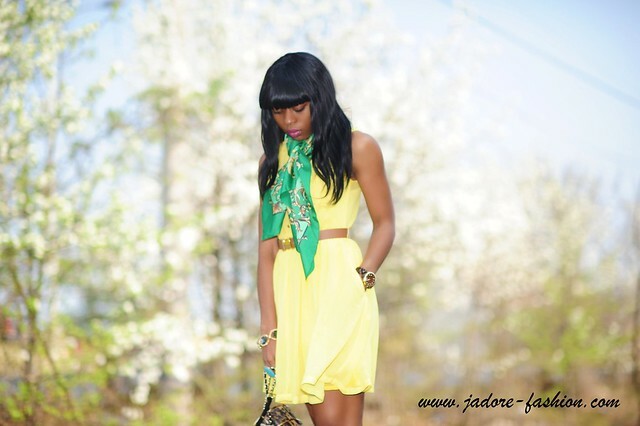 Gorgeous yellow piece, wonderful scarf and so pretty leopard additions!! oh this look is beyond fabulous!!! i love the colours! 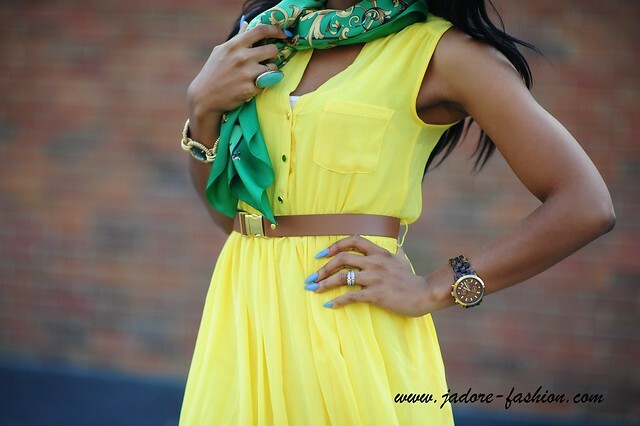 yellow and green at its best;) and how you paired it with leoprint heels and that bag, this is perfection! you are supergorgous darling! fabulous outfit, love the yellow color and LOVE your tiny leopard print bag!!! Woooowww You looks so beautiful with this dress, the colour looks perfect, and the combo with the green scarf is amazing! Woow !! I love your dress. The green scarf is a great match. The animal print shoes are gorgeous. You look beautiful as always. New Orleans is a wonderful place to visit, even better wn there is an event going on. Essence magazine has some conference there the weekend of July and I'm sure you'll love that. Bourbon St is a gd place to walk around and the French quarters are beautiful and so chic. Im sure you'll love it coz I did. Have fun. This is soooo ready for spring my love....so happy and vibrant. I love it. and I love your shoes and bag! I miss NY!! wish I could visit soon. Haha and the bangs are back! Ur signature style...for a while I thot u never did any other style. LOVE the brightness of that dress! Of course leopard goes with EVERYTHING so it's perfect here. Here's to getting away in May for myself as well!! That bag is really unique and cool. Scarves a Beautiful Fashion is as part of fashion measured generally. Such a beautiful color dress! You look so nice! You're beautiful! Love your dress so much! Care to follow one another? I love your blog! love all the fun colors with the touch of animal print. your beautiful. Dear you are working that outfit! Sooooo caute. I am from New Orleans and presently live there. There's so many neat places to visit. I have a section on My blog called :Spotlight New Orleans. Check it out. P.s. No pics of Nigerian food? Such gorgeous shoes&bag!! love them! it's such a gorgeous and colourful outfit!spring in the air! What a gorgeous look! This dress looks perfect on you! Wow, love the bright colours, they instantly put me in the mood for summer!! Questi colori ti stanno davvero benissimo! You look FABULOUS!! And I want that topshop satchel!! This is a really cool look..you look amazing, I love the outfit combo it looks great! Beautiful in yellow! 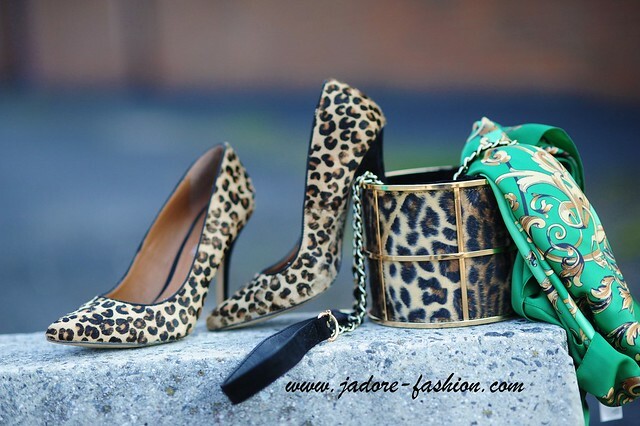 I love the leopard shoes and that bag is TDF!! I've never eaten Nigerian food but I be it's amazing! perfect outfit! love the yellow dress with the leopard print accessories! and the blue nails--killer! wow soooo amazing these colors are soo great on you!!! Love the yellow dress. Looks amazing on you. What a lovely mix of colors and prints my dear! You definitely look spring ready doll. Looking absolutely stunning and yellow is definitely your color. Love your breezy dress. Your scarf is really lovely. love the yellow and green, a unique color combo. and the shoe hmm hmm hmm, love it. I love this look! Absolutely fabulous! My ex's favorite color is yellow and I think of her whenever I see it. I might have to just get over it and wear yellow. I find it looks amazing against brown skin. The scarf is a great touch as well. THIS YELLOW DRESS ON YOU IS A CRIME. BEAUTIFUL ALL I CAN SAY. BUT NO MERITS HERE BECAUSE YOU HAVE A FANTASTIC FIGURE, A GOOD SENSE OF COORDINATING COLOURS (like evrybody else of course! )and SUCH A NICE SMILE.SORRY BUT YOU DON'T NEED COMPLIMENTS, YOU ARE JUST DOING YOUR JOB.LOL. GOD BLESS. Love the colour and the leopard print! nice design.. i m very much impress.. thanks for sharing with me.. keep posting more with your great ideas and designing..